You see the war movies this Memorial Day weekend. Youngsters probably don’t even realize it’s a weekend to remember the fallen. For them it’s barbecue day and heading for the first beach festivity. They should know they can because the fallen saved their lives. For someone like me who has lived through war and escaped – miraculously – being hit by bombs or gunfire, or being taken away by cruel thugs who “followed orders” to put you away, it is difficult to understand that generations who have not experienced war do not understand what it means. Movies show explosions and people flying through the air in pieces, and we sit in front of the screen, either at home or in a theater, and just continue eating our steak or popcorn, not feeling the excruciating pain that goes with it and that those victims must suffer. The US was hit badly at Pearl Harbor, and lost many thousands of brave men and women liberating Europe from Nazi Germany and Asia from Samurai Japan. Some seventy years later, the Twin Towers got hit by Osama bin Laden. On both occasions, thousands of dead. In between and thereafter, there were Korea, Vietnam, Bosnia, and the Middle-East where many young soldiers paid the ultimate sacrifice, defending freedom and civilization. People grow quickly complacent. Bursting bombs and flames on TV and in the movies numb your senses of what it really means: horrible pain, extreme suffering, helpless maimed bodies, deep loss for fellow humans who met this fate in defense of our freedom and ability to continue living the easy life. Did you ever as much burn your finger, to imagine what dying in a ball of flames does to your senses? I don’t like those thugs in the streets protesting, for what? If they ask them, they don’t even know! If I had the power, I would round them all up and make them work hard in an army camp for a while, drill them, make them climb obstacles, discipline them and give them a taste of what freedom really means and what we have to do to keep it. And, of course, some people will scream at me, “You are a bigot, racist!” or whatever. Really? So what then is so good about wild and uncontrolled protestors? Do they need extra protection and baby care under the First Amendment of “free speech?” Don’t they realize they can protest only because they live in Freedom and that violence at it is NOT a right? I remember that -when I studied in Belgium – police rounded up protesting students, hoisted them into trucks, and let them lose one by one far in the country side to walk back home. Good riddance. But the networks love to show the wild ones throwing stones or even Molotov cocktails at the police – who are protecting them normally from thugs like themselves – because those images are “sensational” – attract viewers – and are good for the ratings and advertising fees. It’s all very topsy-turvy. On Memorial Day Weekend, as on other memorable days, I hang out the flags, of the US and Holland. In memory of the fallen who made it possible for me to live a good life. I think of the many with maimed bodies, still finding the willpower and strength to get by with what they have, and even do Olympics. Those are the people I respect. Those are the people those street thugs should take as an example. True, anarchist people have always existed and always will, from the old classic days of Romans and Greeks to the French Revolution and the Nazi Brownshirts. The only difference between then and now is, that they can be shown on TV and that the Networks love to show them. They give these thugs the notoriety that they do not deserve at all, in particular when they put a certain political party in a bad light. How convenient for the “objective reporting” media. What a difference our Freedom Fighters make! In the Army, on the sea and in the air! May 4 is Audrey’s birthday. Each year we remember her. I do and so many others. This portrait stood on the grand I played on at my grandparent’s home in Holland. It is a rare picture that you won’t find very easily among the thousands of Audrey pictures floating around on the internet. It was taken by Noël Mayne in London in the early fifties when Audrey was modelling and acting in cabarets, and not yet discovered. Her mother, who I used to call Aunt Ella, had left it with my Aunt Nini (the spouse of Count John Paul van Limburg Stirum who from 1916-1921 was Governor of the Dutch Indies where Aunt Ella, her niece, married her first husband). She visited Aunt Nini from time to time, and I met her there, too. She gave it to me, and so it landed on my piano. Not so long after that she sent me the famous picture of Audrey in Gigi on Broadway, for which she had been selected when she visited Cannes in 1952. For a long time I thought this photo was just for me, until I found out it was all over the place. I met Audrey for the first time in 1943 when she was just thirteen and I seven. That was during World War II when she lived with her mother and two stepbrothers in her grandfather’s house in Velp, near the city of Arnhem, close to my grandparent’s place. Her mother was then divorced from her second husband Mr. Ruston, who had stayed in England. Baron van Heemstra was Mayor of Arnhem before the war. He and my grandfather were related. Audrey came to visit on a horse-driven carriage, sitting between her mother and grandfather, on an afternoon for tea. She and I ran around the estate together. Though danger of bombs and fighter planes were a constant threat, and Germans were everywhere, even on my grandparent’s estate, we were only interested in my grandmother’s great cake. Audrey was enthusiastic about becoming a ballet dancer. Both pictures are family pictures. The first (which slipped into the internet) is Audrey at age 13. The second is Audrey dancing in Arnhem at age 16, also given to me by her mother through my Aunt Nini. I gave the portrait and the dancing originals to the Audrey Hepburn Children’s Fund for keeps. For some reason, I could never forget her smile. It had a brilliance I would never see again until I met my wife. Then war reached a pinnacle and we could not see each other. I lived in Amsterdam, and when everyone thought we were going to be liberated, we heard that the battle of Arnhem had failed. There were thousands of deaths. We feared Audrey and her family were dead too. We suffered a long very cold winter without food, the hunger winter of 1944/45. Then, finally, on May 5, 1945, we were free, after five bitter years of war and suffering. But things changed rapidly. My father died shortly after liberation when he was run over by a British truck while bicycling to his brewery in Amsterdam. My grandfather died shortly thereafter of illness. It was a horrible time for me. Then we moved in with my grandmother in the countryside. But Audrey moved in the opposite direction to Amsterdam with her mother, to continue her dancing lessons with Sonia Gaskell. I did not see them anymore before they left for London where Audrey – being British through her father Joseph Ruston – had received a scholarship at the Rambert Ballet. Audrey kept the name Hepburn her father had acquired from his grandmother’s maiden name. I was at boarding school, about 16 or so, when my mother called me that Audrey had become a film star! It was “Roman Holiday,” with Gregory Peck. I still see myself standing at the “middle court” of the school being admired. All of a sudden I became “famous”, too, because I knew her. I think each time she made a new movie, we went to see it immediately with my family and family friends who knew her. I remember we did not like Sabrina that much, because she married Humphrey Bogart, who was much too old for her and an obvious mismatch. Gary Cooper with Audrey in Love in the Afternoon was better, although he was also too old. Couldn’t they find younger guys? It took years before she finally teamed up with George Peppard in Breakfast at Tiffany’s in 1961 and with Cary Grant in Charade in 1964! Aunt Ella kept sending pictures, one with her first husband, Mel Ferrer, and their little son Sean, which was used for a Christmas card. It was only years later in the mid-seventies that I saw Audrey again, at a surprise moment, when she visited friends for a birthday party in Geneva. It meant the world to me: finally. I had written to see her when she was filming Charade with Cary Grant in 1963 in Paris where I studied. But, even though she wrote back she remembered, she was so busy she did not have time to put a stamp on an envelop. This time we could remember the war time and our first encounter in Holland. I wrote a story about my fascination with Audrey. There are many books about her, including wonderful picture books issued by her sons, Sean, and Luca (from her second marriage to Count Andrea Dotti, her psychiatrist). My story is a personal one I cherish, because it is mine alone. It is for sale on Amazon and whatever proceeds I get from it I send to the Audrey Hepburn Children’s Fund. Audrey was an icon for UNICEF and did so much good raising money for the many deprived orphans and malnourished children of the Third World. She traveled all over the world after her movie career, and then got felled by illness herself that took her away from us in 1993 in a very short time, only 63 years old. It was a very sad moment to learn she had left us, but at the same time so enlightening, as I had had the privilege of knowing her, albeit at the outer edge of her fabulous orbit. I still benefit and draw strength from her brilliant beam of light in the difficult moments of human life. 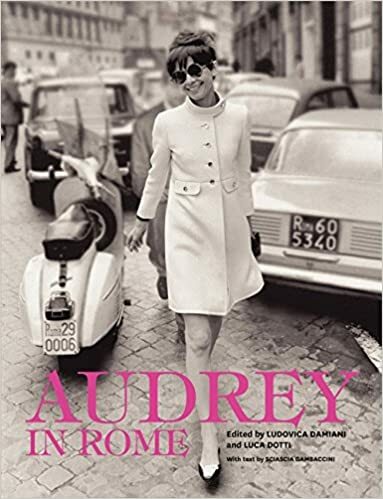 Who could have imagined that that little girl I met during a cruel war would turn into that magnificent woman for so many millions of people, as her son Sean titled her in his wonderful picture book, “An Elegant Spirit.” And Luca’s lovely photo book “Audrey in Rome” as well. Luca Dotti’s Audrey Cook book!